Have you looked at your existing Community or the one you are considering and asked the question, “What is the INTENT of this effort?” Chances are you have, maybe you haven’t. We have some ideas of how you might think about the WHY of your effort and will try to convince you that if you are not thinking about how it contributes to creating value for your organization, then, maybe you should be rethinking your efforts. Often people are distracted by the bright shiny new feature on a social platform. They lose track of what outcomes a community needs to bring them and instead they are only thinking about the ‘new thing’ that caught their attention. Capturing attention is important. More important is making sure that everything you do in efforts to better communicate and collaborate are intentional and driven by an informed plan. When you have a purpose and intent, you will be successful. We think about Community Intent with something that’s easy to remember, called the Four I’s – Interaction – Information – Insight – Initiative. 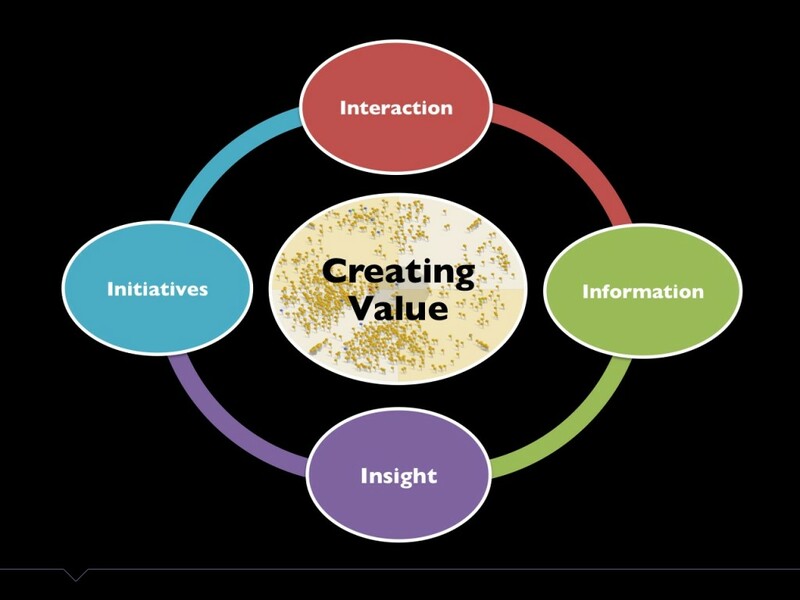 These concepts are interrelated and each one contributes to creating value for your organization. In fact, they are in a circle on purpose. As each step leads to the other and continues as long as you have a Community. Let’s assume your intent is to create value. How could a private online community help you reach that goal? What’s important to your specific area of focus? What is your organization measured on? So, how does having a clearly defined Community Intent help you create value? Every community activity needs to stimulate and engage your users. This is the critical first step, as without interaction, you don’t have a community. Strategies to drive interaction could fill an entire book. We’ve written about them here and here. Every audience responds differently and you need to be paying attention to what keeps them fascinated. This is the Holy Grail for Community Managers. There’s a cliché for this, “You can lead a horse to water, but you can’t make them drink.” Unless they’re thirsty. So, what makes your audience thirsty? The community interactions lead to the creation of a lot of information. It can be form forum posts and discussion threads. It can be photo uploads and links to resources. In the case of introNetworks it is also the amount of new information that is captured in a users profile. Spanning across four dimensions, users outline their passions, interests, professional skills, where they can help, where they need help, their experience and their aspirations. When you aggregate all of the information from your Community in one place and give yourself time to understand it, you will naturally be ready to proceed the next step. The information is interesting and if you are at all intellectually curious you will end up getting lost in it. The information on it’s own won’t help create value unless you take time to study it. See how you can connect the various pieces. What trends are you seeing? What skills are highly ranked, or lowest? Are there gaps in critical experience your organization needs? This intense and purposeful focus and reflection on the information leads to breakthrough moments. Unfortunately, our experience is that most people don’t take the time to look and dig even a little bit into the information. Worse still is if your community is on a free or public site that doesn’t give you access to the raw information. Someone has to connect the dots and it’s best if it’s you. You are the one with a vested interest in the outcome. The insight will give you ideas to create new projects, new initiatives that would never have been attempted if you had not studying the information. Imagine learning that 30 percent of your users need help in a certain area and you have another 11 percent of your users saying that they are skilled in that exact same area. One initiative might be to pull these two groups together so they could learn from each other. Another might be to create a class or lunch-and-learn and invite the 30 percent to learn from the 11 percent. So, do you take the initiative or does your organization create new initiatives? The answer is yes. Imagine visualizing what could you do if you had 50 breakthrough insights into your audience? What initiatives could you start? What ongoing activities might you stop? What value could be created? What interactions do you need to being that will drive engagement, that leads to new information, to deliver critical insights, so you can create more targeted and effective initiatives? What you learn informs what you do next. Everything you do should lead to creating more value. Working with other people to co-create that value is satisfying and in itself is a reward. Are you thinking about your community efforts with an eye towards how it creates value? If not, take a minute to consider how you might transform your organization’s efforts in this area if you thought about the Four I’s in this new light. Give us a call, we know a bit about co-creating value through community.